Because of the unique situation and special skills required, Glass & Concrete Contracting was chosen to perform the selective demolition of the 15 story curtainwall and EIFS cladding. The crew worked along side Baker Concrete, keeping the demolition 2 floors above the new construction at all times. The challenging nature of the project required that strict scheduling and impeccable safety standards remained a constant. Glass & Concrete Contracting worked after hours and weekends to adhere to the high pressure deadlines and ensure that the construction could continue on schedule. Demolition services included removal of a 15 story curtainwall and EIFS facade and removal of structural steel roof louvers and protruding cornice. Harrah’s Cherokee Casino & Hotel lies in the heart of the Smoky Mountains. 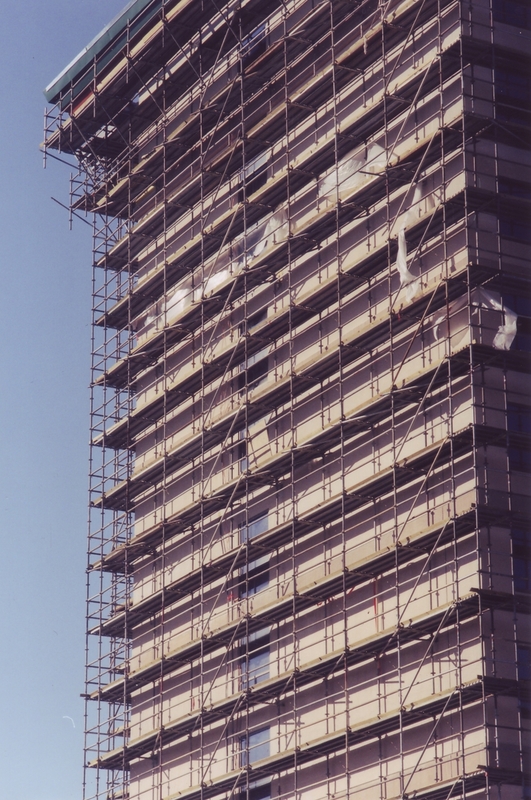 During the construction of the hotel in 2002, Glass & Concrete Contracting was contacted to make recommendations on the anchoring system to be used for vertical access to the building. GCC later came to play an essential role in the maintenance of the high rise hotel. Quarterly maintenance included painting, waterproofing, cleaning, changing light bulbs and inspecting the vertical surfaces. Two years after the hotel was built, a new 324 room hotel tower was planned. The new tower was to be seamlessly connected to the first one on all 15 floors and the existing hotel was to remain occupied and fully functional during the entire construction.